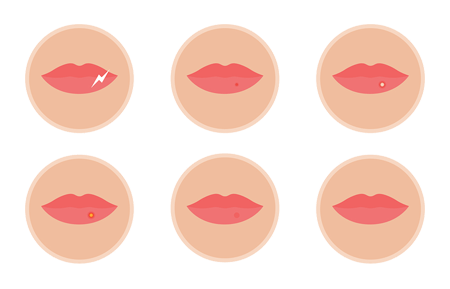 The herpes simplex virus type 1 (HSV-1) is responsible for those annoying blisters at the corners of your mouth or on your lips and gums. While untreated blisters usually disappear within a week or 10 days, they’re painful, unattractive and contagious. According to the University of Maryland Medical Center, there is no cure for this virus. Research shows, however, that a healthy diet with lots of lysine-rich foods may lessen the frequency and severity of cold sore outbreaks. A six-month study by researchers at the General Nutrition Corporation, the Indiana University School of Medicine and the UCSB Computer Sciences Department found that 1543 herpes sufferers taking an average daily dose of 936 mg of lysine had significant improvement in the frequency, duration and severity of their outbreaks. Nearly 9 of 10 reported that lysine helped them. The good news is lysine is present in lots of foods you’re already eating. The bad news is that a second amino acid, arginine, can counteract the benefits of lysine by helping the herpes virus replicate. Your solution is to eat a diet of foods providing twice as much lysine as arginine. Lysine-rich, arginine-low foods include almost every fruit and vegetable. Eat mangoes, apples and apricots for healthy lysine-rich snacks. Beef, lamb, fish, eggs and dairy products, including ice cream, are fine. Caution: Browning your food (known as the Maillard reaction) may decrease its lysine. This reaction occurs when foods containing both carbohydrates and amino acids are heated. The heat causes the carbon molecules in the carbohydrates to combine with the amino acids, like lysine, browning the food and changing its flavor. But the reaction also makes the lysine less available. Some high-arginine foods are chocolate, nuts, seeds and nut butters, brown rice, oats and beer. Watch your intake of caffeinated beverages, which make lysine more potent. Even if they’re not on your list of favorite foods, broccoli, Brussels sprouts and cabbage all contain a compound called Indole-3-carbinol. Preliminary research indicates this compound can inhibit replication of the herpes virus. Tossing together some cole slaw with cabbage and lysine-rich apples could double your protection against a cold sore outbreak. Preheat your oven to 350 degrees. Microwave the liquid ingredients until blended. Place the broccoli in a 2-quart casserole dish and top with chicken. Add the liquid, sprinkle the cheese evenly on the top. Bake until it bubbles, about 30 minutes. Serve with a fruit salad, and ice cream or pudding (no chocolate or nuts) for dessert. Health Disclaimer. Copyright ©2009. Published with permission.